We are headed on our first official vacation as a family of four. We’ve been planning our trip cross country to see my sister for the past 5 months and it is finally here! We booked the flight, secured our accommodations, but what comes next is just exhausting….PACKING! Due to flight restrictions, we are only allowed one suitcase per person. So we’re fine, right? Uh, NO! Let’s face it, I’m a woman and I LOVE shoes! That means that one of my son’s checked bags will be the best part of my outfits and the two boys will share a suitcase. Under normal circumstances, this would be fine, but the ever changing climate of California has us packing for two very different temperatures. So how do I fit it all in (and not wrinkle it all)? I’ve kept the dressier clothes (dress shirts, dresses, etc,) in the dry cleaning bags that they came home in. 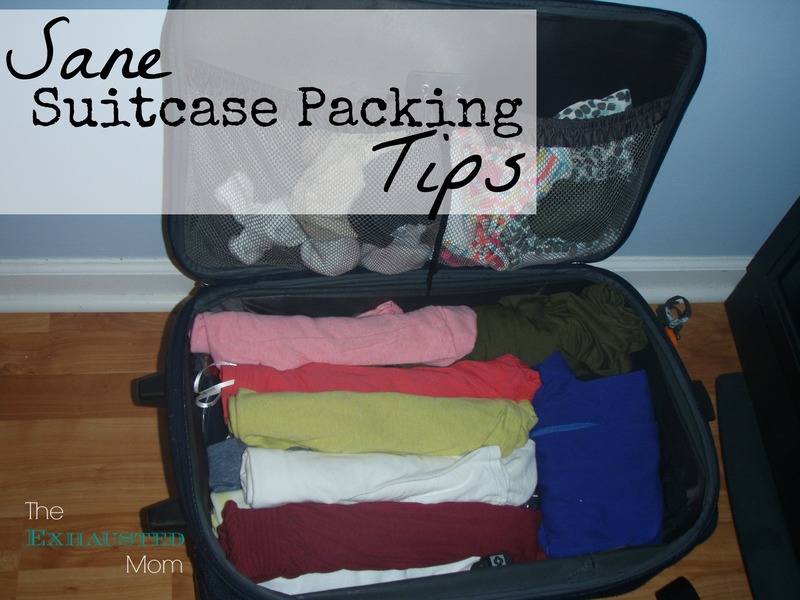 The bags keep the clothes from wrinkling even while folded in the suitcase. I put these on top just to be safe. I rolled my cotton clothing (t-shirts, shorts, etc.) into a tube shape. I also especially do this with jeans since they are so big and bulky. This helped with the space issue of the clothing…it also helps with less creases when other items are on top of it. Bathing suits, socks, and accessories go in the pouch area at the top of my suitcase. Since you’re allowed a personal item on the plane, I bring along one of my biggest purses. This way I can bring my small “every day” purse and make-up bag on the plane with me, along with any electronics. You never know if your bags are going to get lost along the way…at least you have your make-up! Now if only I could find a way to fit all my shoes in! Have a great trip! I bet you’ll be the even more exhausted mom when you return!